Let me remind the opposition (whoever they may now be!) why they were able to get the popular mandate from the voters of Malaysia and garner 51% of the votes in the last general election. 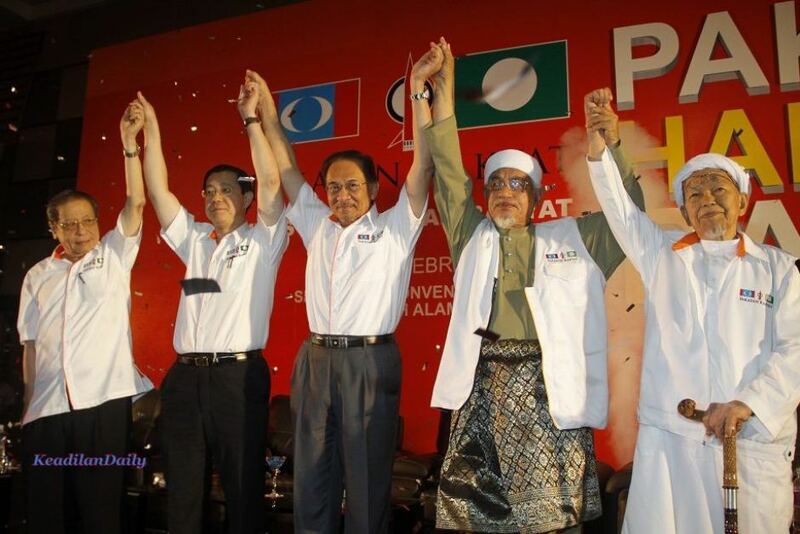 Lim Kit Siang, Lim Guan Eng, Anwar Ibrahim, Hadi and Tok Guru together, arms raised in unison, giving the message to all Malaysians that no matter what their differences, they will be together to serve the people of Malaysia should they be called upon to form the Government of the day. If they can somehow forge a union from racial, religious and political diversity then there is hope yet for our nation, our people and for our future. The people of Malaysia did not fail them. Pakatan Rakyat received the popular mandate to form government but six decades of gerry meandering by a corrupt Umno who intends to stay in government at all costs – through legal or illegal means – meant that a popular mandate is not enough to allow the opposition to form government. That would have to wait for another day when a level playing field is in place to ensure that democratic principles are adhered to. The burden of race has inflicted upon us all many limitations. Ketuanan Melayu in lieu of meritocracy. The immediate benefit that migration brings against the tedious work and sacrifices that nation building asks of you. Political correctness at the expense of political realities that effectively impedes national growth and consensus when our nation has need for it most. All this that I say here, is for you all to reflect as the Sarawak elections unfolds before us all. Today at the very moment when the Umno led Barisan Nasional is at it weakest what is happening to the opposition? KUCHING: Going against earlier pledges not to fight each other in the upcoming Sarawak election, two component parties of Pakatan Harapan are nevertheless doing precisely that as they take each other on in Batu Kitang. Pakatan Rakyat is long gone – dead and buried without so much as a respectful burial for a political entity that 51% of Malaysian voters choose to lead them in the last general election. Think about it! The people of Malaysia voted for Pakatan Rakyat and what Pakatan Rakyat did was to turn around and told the people of Malaysia “F*#k Off”!…our own political agendas, our leaders individual needs and our racial and religious wants comes first before the national aspirations of the majority of the electorates that voted for Pakatan Rakyat. Thank you very much we all say…we will not forget that in the next general elections. For now let me have my say on the state of the opposition today. Lim Kit Siang has disappoint many Malaysians because he will not lead the opposition in lieu of Anwar Ibrahim. He deserves to lead, he has earned the right to lead and there is nobody better to lead the opposition, but Kit Siang will not lead because “political correctness” does not allow him to be leader of the opposition. That is why the opposition is in disarray. That is why the opposition is failing if it has not already failed. And that is why when Umno is at its weakest, so is the opposition! Politics abhor a vacuum. I have nothing against a women to lead the opposition but I have everything against a women leader, against any leader, who fails to lead. Azmin Ali is too busy being “presidential” as MB Selangor and has started to stray into political delusion of grandeurs that has dog many other overly ambitious political leaders. Will Pakatan Harapan want anything from what Azmin Ali already has in Selangor? Does Azmin Ali need to work with the leadership within Pakatan Harapan or do they need him and Selangor more than Azmin and Selangor need Pakatan Harapan? And an “agreement in principles” on how the Sarawak Elections are to be conducted can be agreed to if, and only if, they served his and PKR’s political agendas, NOT Pakatan Harapan agendas! This is what happens when there is a political vacuum within the opposition! Everyone for themselves – for their own needs and for their own greed. There is no political vacuum in Umno. They may have a flawed, corrupt and irresponsible leader but Umno has a leader in Najib Razak. When they tire of him they will change him but for now there is focus in Umno, there is leadership. For as long as the Chinese think they cannot lead politically in Malaysia because of race and religion. For as long as the Malays think that race and religion confers upon them the right to political power without any consideration to meritocracy, responsibility and accountability. Then that is the length of time our nation, our people and our future will be damm to achieve less that what we can, if not damm, eventually, to failure. Great men, with greater purpose in life than themselves, can go on to do greater things. The late Tok Guru Nik Aziz, the late Karpal Singh have done their part. Anwar too – but Anwar is now indisposed. Lim Kit Siang has still to run the gauntlet…..we will have to wait to see if he does! fear that Ketuanan Melayu will no longer be possible. Apa Cina mau lagi? This will plague the Malay psyche who forever fear losing Tanah Melayu. steadyaku47 : DK I have understood the “Malay mindset” from the time I could think for I am a Malay myself….but why would any Malay want to be led by any Malay who will rob, steal, plunder and pillage a country that they mistakenly call their own? 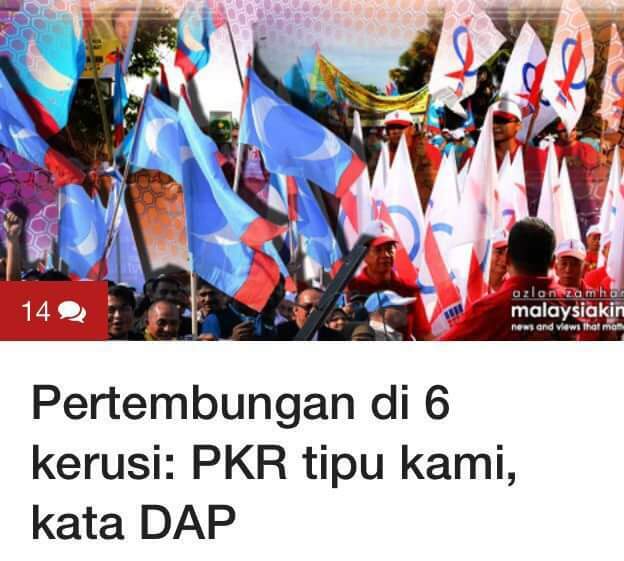 If, despite our numerical advantage and after 60 years of Umno a Malay is no longer The Peminpin – then maybe it is what the Malays mau?